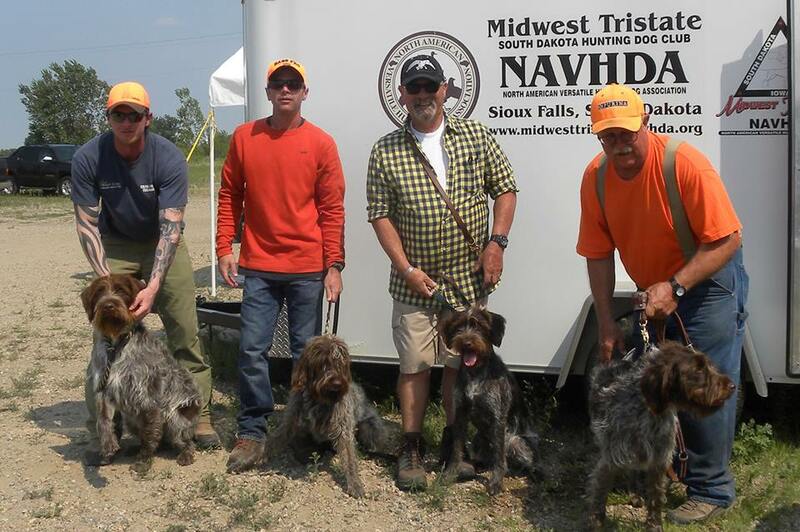 On Saturday, August 17th was our first North American Versatile Hunting Dog Association (NAVHDA) Utility Test in Sioux Falls, South Dakota with the Midwest Tri-State NAVHDA Chapter. In the running were Sweetgrass Plainsman Samson “Sam” age 5 and Bourg-Royals CB Bluestem “BB” age 2 with my husband Charles handling both dogs. The Midwest Tri-State NAVHDA Chapter is one of the best in the country and folks come from all over to participate in their events. The Natural Ability dogs were first in the field on the day, with Sam as the first Utility Dog who ran. 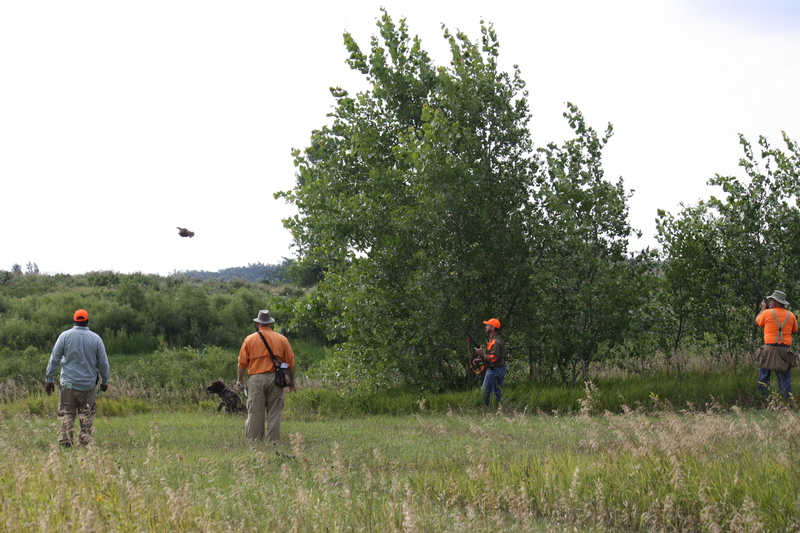 His very first point was not on one of the planted chukars, but was a wild rooster pheasant! The gunner said that he was twitching to fire, but it isn’t that time of year just yet! Sam did fairly well on his first three finds, but it just started to get out of control. 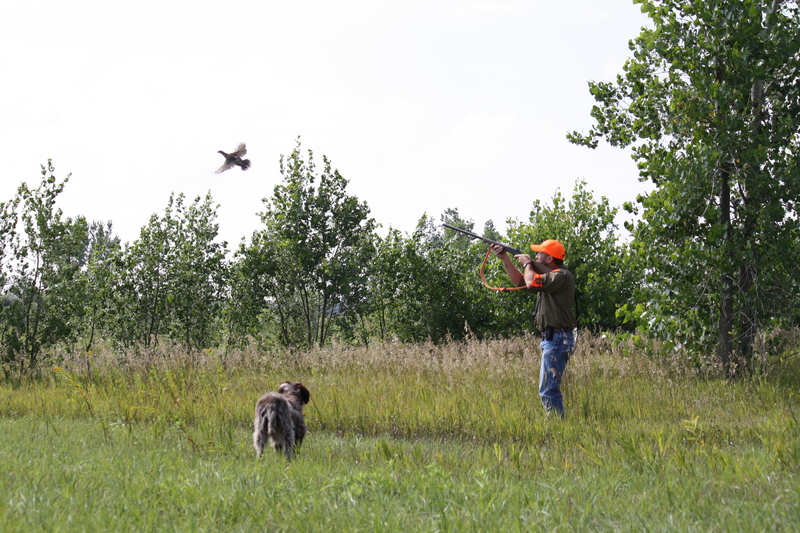 The field was packed with birds and he was finding them every 45 seconds in some places. He just came apart. 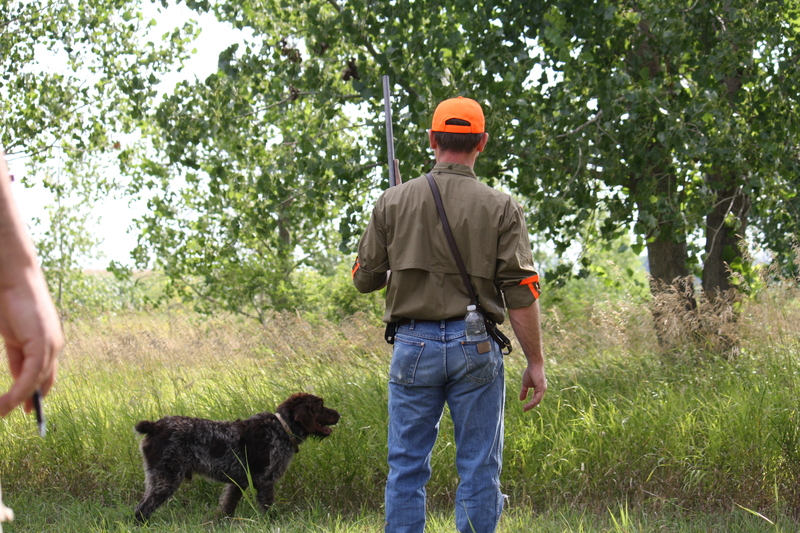 Sam has been hunting wild birds his whole life but has only received steadiness training in the past year, so he just couldn’t handle the overwhelming number of birds. 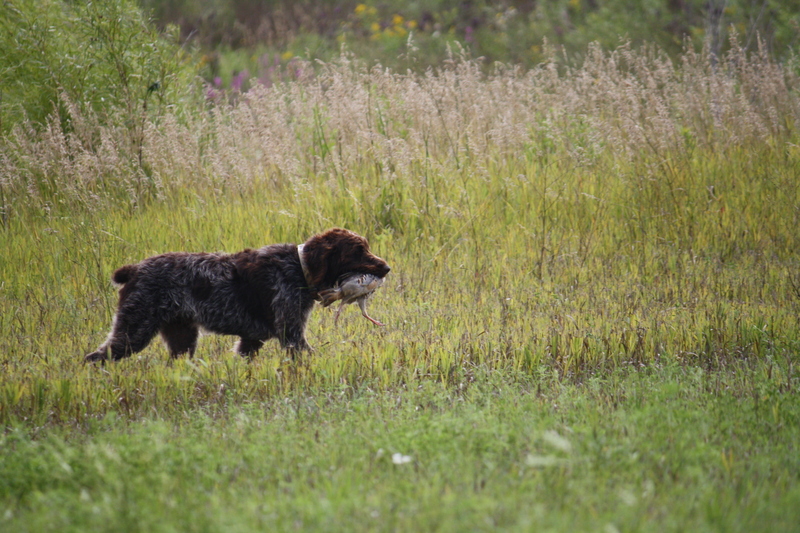 His pointing and retrieving never fail, but his habit of breaking on the shot came out in full force. He probably had 10 total finds, but only held on maybe 3 or 4 of them. Afterwards, Apprentice Judge Leo Boman told us that we need to go ahead and make a correction with the dog in the field, not letting him mess up over and over without trying to right it. This is different than AKC, where the dog is supposed to work without correction and commands or face an order from the judge to “pick up your dog” (meaning you failed). So that was a great tip for future handling. Although it shows Charles carrying a shotgun, it is not loaded and only the two chapter gunners do all of the shooting for the test. Charles was pretty disgusted as he walked out of the field with Sam, but I knew that was where the dog would make mistakes and his time to shine would come later on in the day. We had to shake it off quickly because we were running 2 out of the 3 utility dogs that day, so it was a short break until it was BB’s turn. 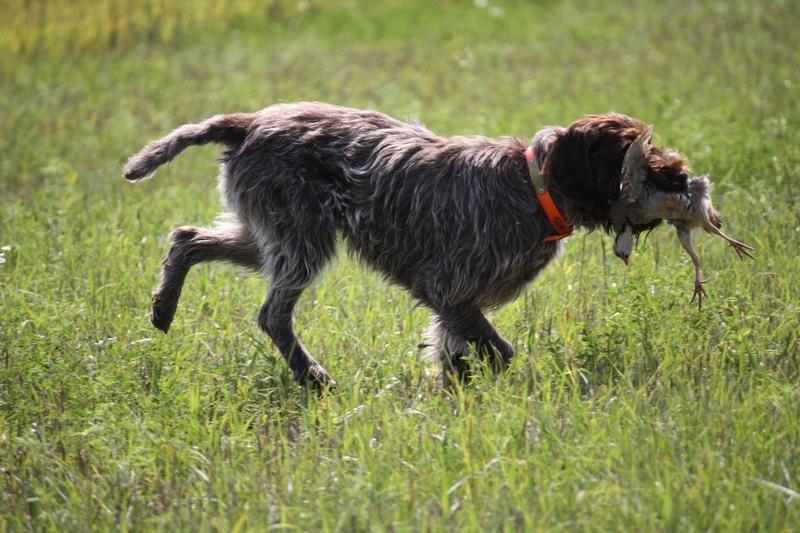 BB has become an outstanding field dog and proved in this test that she is ready to move on to Master Hunter runs in AKC (American Kennel Club) Hunt Tests. 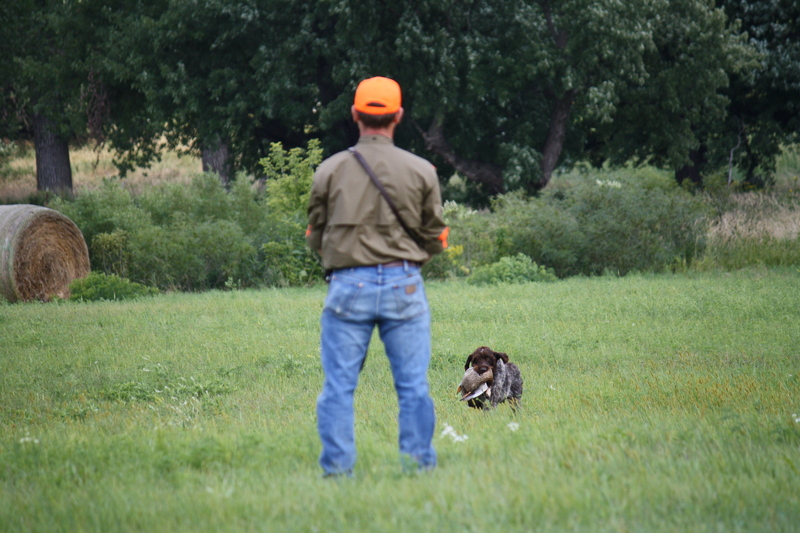 She had 4 or 5 finds and every single one was textbook steadiness. There was even a point where Charles chose to run after a bird to try to flush it and BB just stood there stone still. We walked out of the bird field with BB feeling as if we’d taken our first steps toward a Utility Prize I. We were very hopeful. It was time for a delicious lunch of chili and cornbread. You can’t beat the food at NAVHDA tests! The next order of business was the duck search for the utility dogs. Sam was up first and we had no worries about his performance. Swam the full 10 minutes and searched the pond thoroughly. He did not find the duck, but that isn’t the point of the exercise. BB’s weak spot is the water. With Sam always dominating the retrieves while we are duck hunting, she just hasn’t had a chance to get fired up about it. She did an okay search, then came and sat down by Charles at around the 7 minute mark. 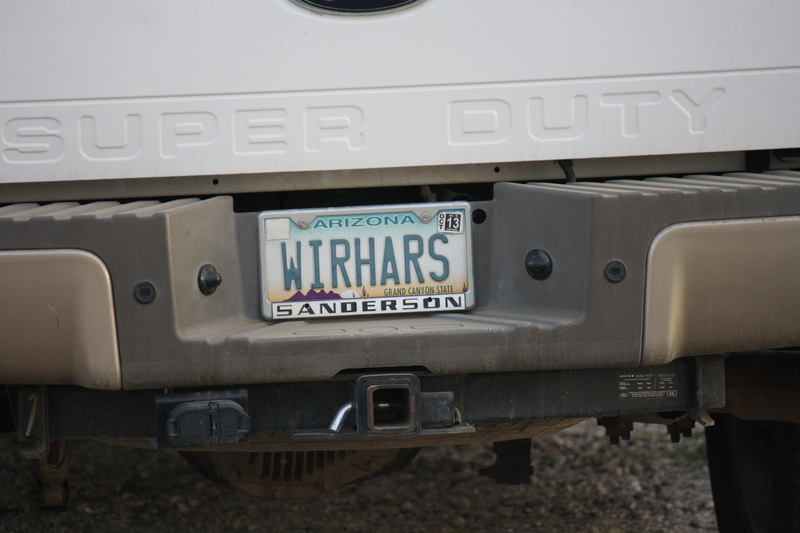 Afterwards we talked to Dan Griffith, who is a full time trainer of German Wirehaired Pointers and a very experienced Utility Tester. We were wondering if Charles should have re-cast her out into the pond. Dan told us that if you re-cast without judge’s instructions, it is automatically a one point deduction. If the judge wants you to re-cast, they will tell you. Do not re-cast on your own. Another great handling tip for the future. The Natural Ability dogs did their duck retrieve first (which BB had no problem with at her test, NA Prize I with a perfect score of 112). The setup for the Utility dogs was that they walk on leash on heel through a set of posts to the blind. 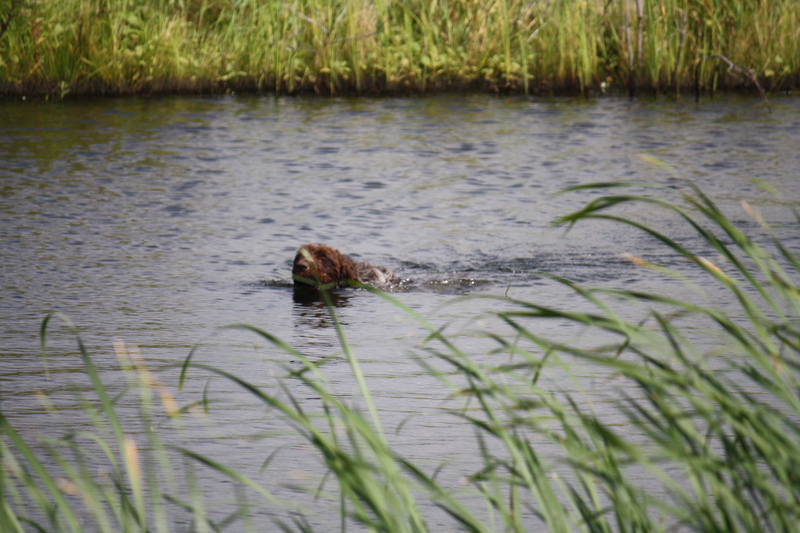 The dog is released from the leash and “whoaed” behind the blind. Shots are fired and the dog has to stay steady behind the blind. 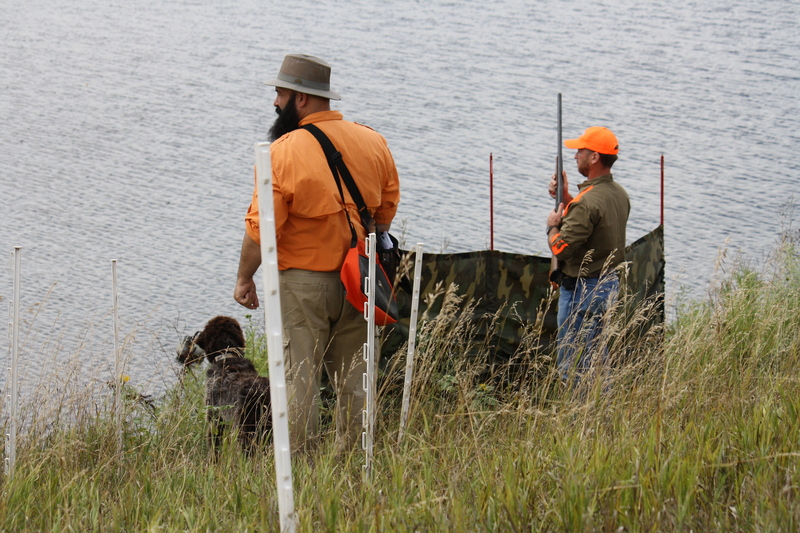 The dog is then moved just outside of the blind so that he can mark where the throw of the duck lands. More shots are fired and the duck is thrown. Sam marks the throw. You can see the heeling posts in the foreground. 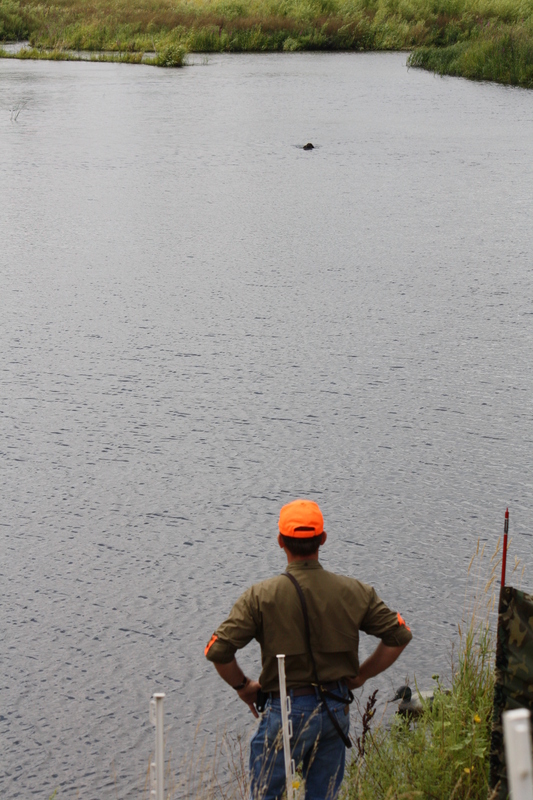 We were in no way prepared for the 50 yard duck retrieve that they set up for the Utility Dogs. 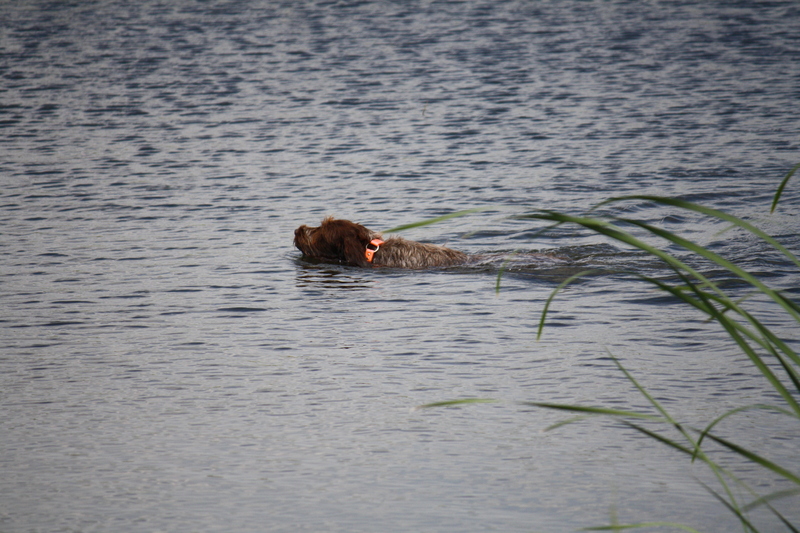 The throw was way outside of shotgun range and it is only because of Sam’s absolute love of swimming and water that he was able to pull it off. We had not trained for that distance at all. At that point, we knew that it would take a miracle for BB to get that duck. 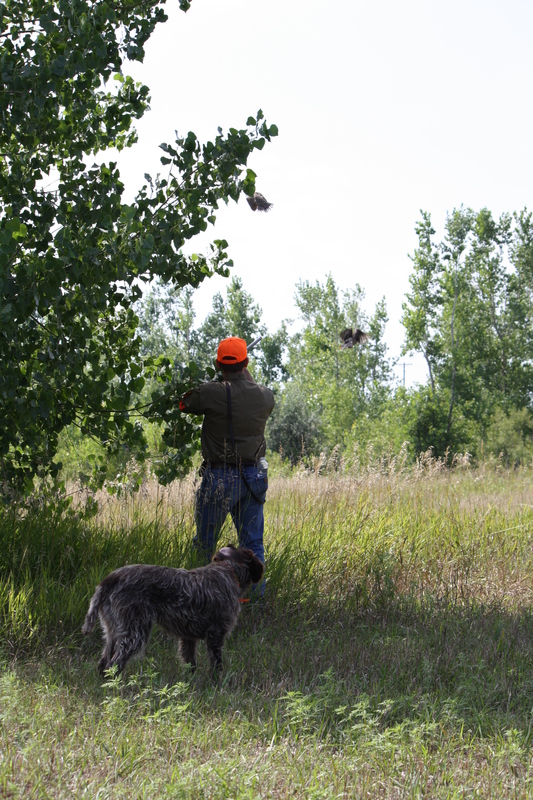 She did great in the blind and I saw her mark the throw, but she got distracted by the decoys next to the shore and would only go about 20 yards out to search (within shotgun range). We tried to cast her farther, but to no avail. BB did not get the duck and received No Prize as a result. BB does an amazing job of tracking and always goes from point A to point B flawlessly. But as she didn’t get the duck, it was all for naught. So we ended the day with Sam earning a Utility Test Prize III. It was our first test and I was just happy to bring home a prize, especially on Sam who has just been a wild bird hunting dog for so long. BB was perfect in everything but the water. We will hunt her alone on wild ducks down in Missouri for early teal season in a few weeks and then Nebraska High Plains duck season a few weeks after that. It was a great time in Sioux Falls and we learned so much from folks. It was great seeing Cliff Koele of Coppershot Griffons, home of several NAVHDA Versatile Champions, who recently announced his retirement from testing and breeding. He will now focus on fishing and mentoring other breeders/trainers. We had so much fun with all of our fellow handlers, the volunteers and the judges. We learned and laughed. It’s just dogs after all. Congratulations to our fellow griffoniers who also participated in the weekend from Aux Lake Kennel! From left to right: Keith Feldhaus and Deke UT I, Scott Moore and Josie as observers, Rick Jones and Jessie NA II and the godfather himself: Larry Woodward and Holly UT I. Thank you Kim Jones for allowing me to use your photo. We had a chance to spend time with the Joneses since Jessie ran on Saturday, but only saw everyone else briefly as we were ships passing in the night. Their UT dogs ran on Sunday. Wow and a big thank you to the Midwest Tri-State NAVHDA Chapter for a great test. We will be back. I have so much more to write about, but am just out of time for today. 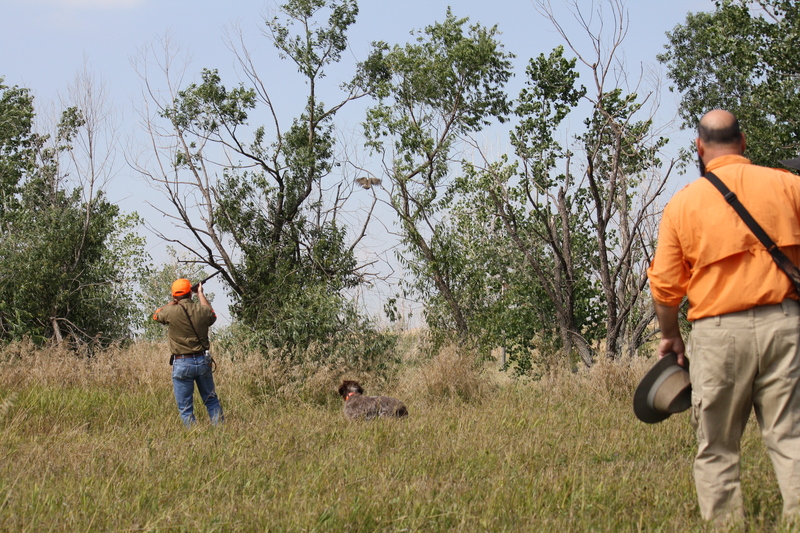 I will be sure to post again later this week before hunting season starts on Saturday!! I have some pupdates that I need to clear out of my queue before I get way behind! Talk at you later this week.